Not all homes are created equal, nor are all women. Some just have that je ne sais quoi that elevates them to the status of icon, even perfection. 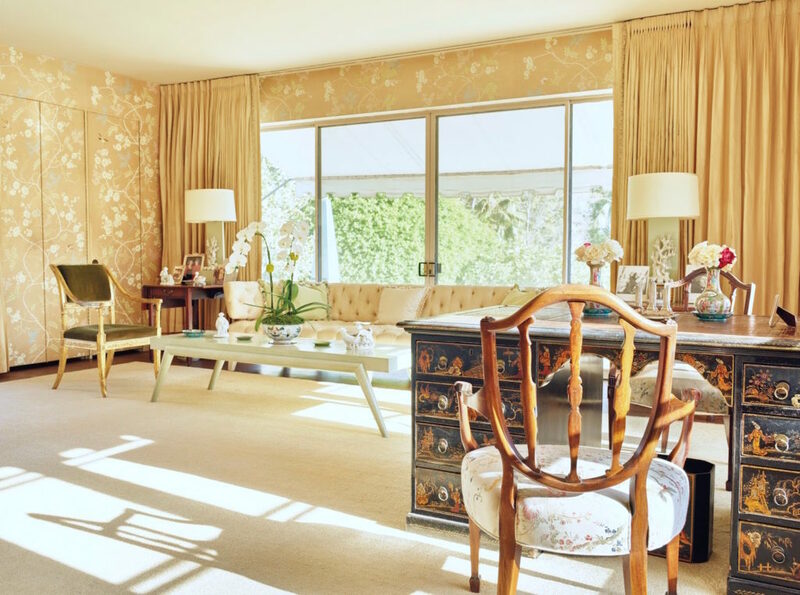 With an upcoming Christie’s auction of her personal effects, Betsy Bloomingdale’s home is worth a tour. Those were the days. While the photo itself has such energy and balance, it’s the women populating it, with Betsy at its epicenter, that make this such a snapshot of an age and lifestyle. I never really thought much about Betsy Bloomingdale. She was the ubiquitous friend of Nancy Reagan in the 80s, whom everyone touted as having such style. But, frankly, I never got it, nor did I care enough to find out. With her recent death, late in 2016, photos and images of her home and lifestyle have circulated. 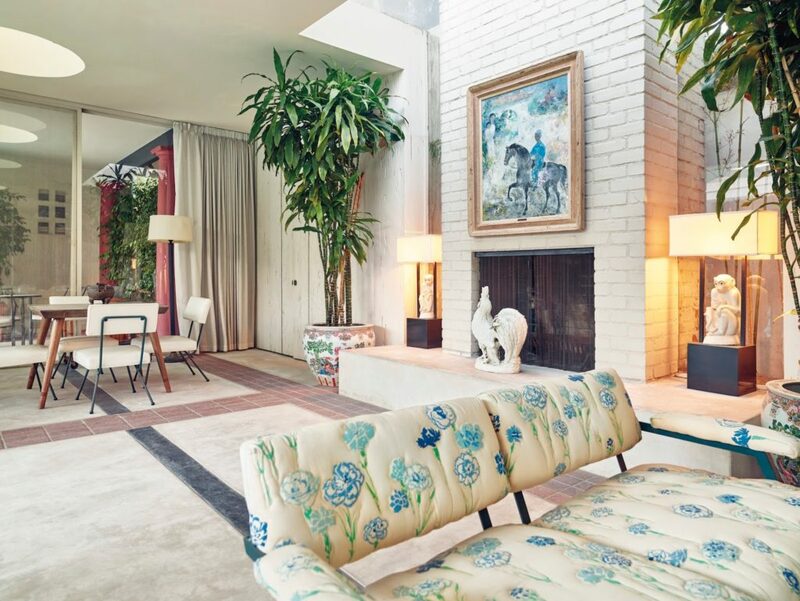 Tom Ford has purchased her stunning, timelessly elegant home. 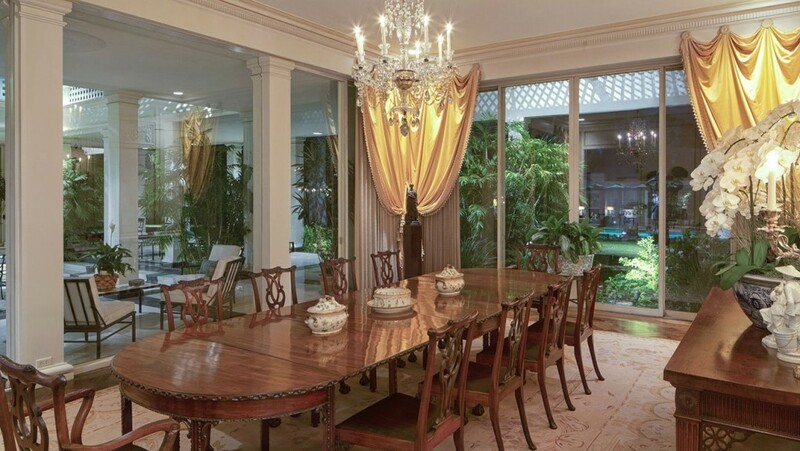 And all her things are being auctioned, starting tomorrow, by Christie’s. 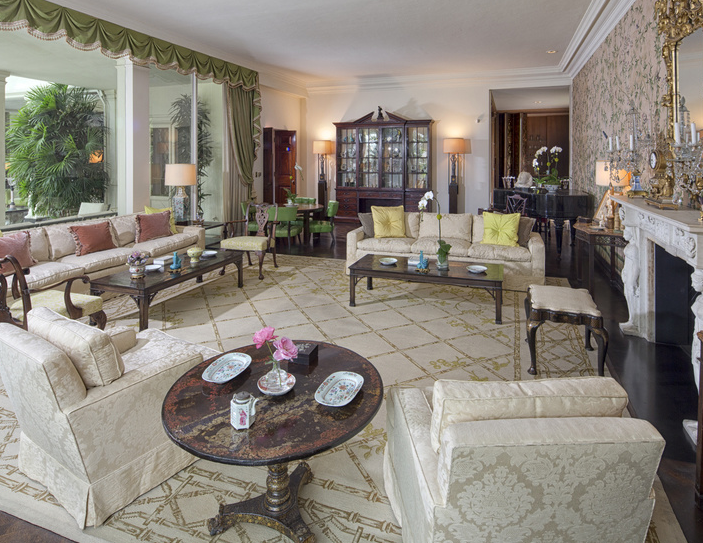 Touring her home is like a step back in time as well as a lesson in timeless decorating. Understated and elegant – a rare thing in Hollywood. This is the front exterior of the house. The entryway. This is the image that got me. I just love the way you look entirely through the house to the lawn and pool beyond. 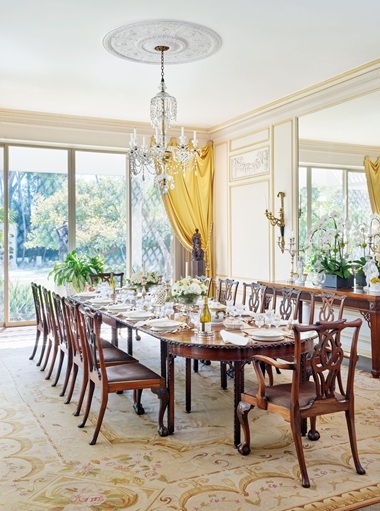 Look closely and you’ll notice that the house is built around a central, open courtyard – perfect in a climate like southern California, and delightful for entertaining. Looking back toward the front door. The proportions and scale are just right. 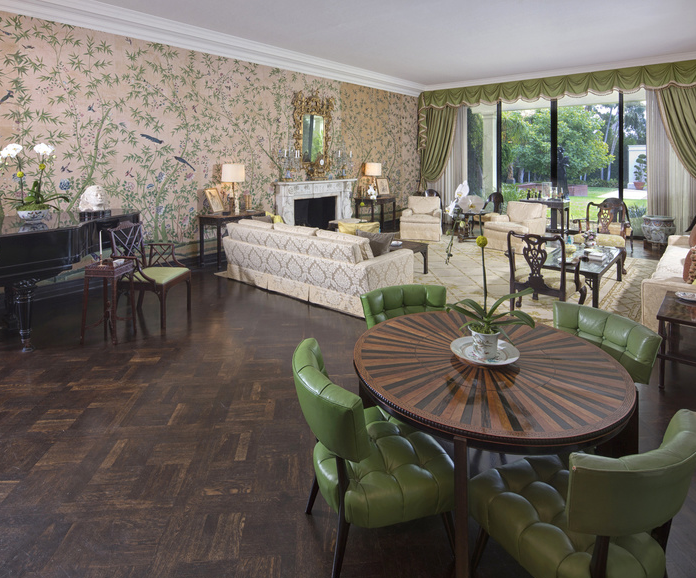 Billy Haines designed this house’s interior and many of the pieces of furniture. 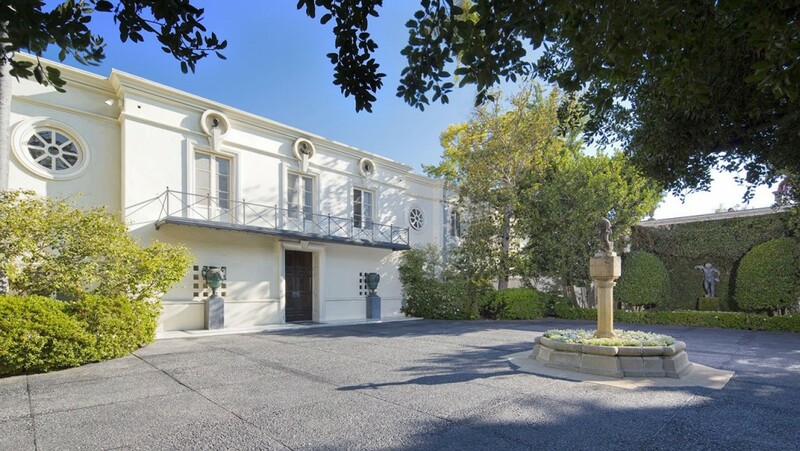 He never signed any of his pieces because, he said, his work was his signature; you just knew when you were in a William Haines-designed home. 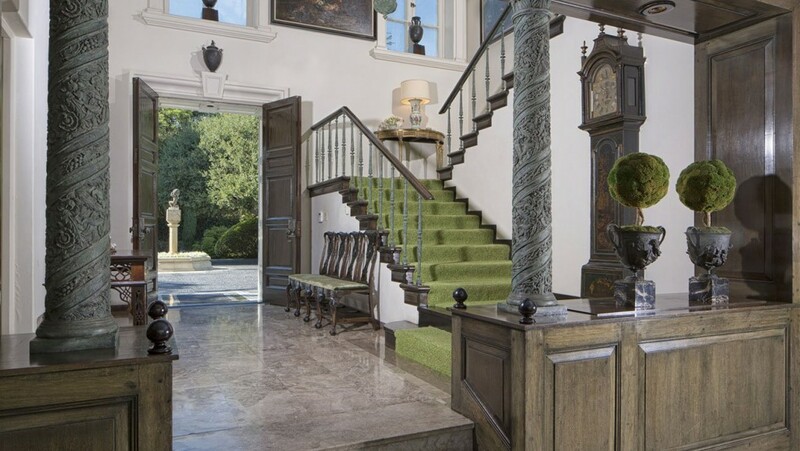 (These steps lead down to the passageway which flows to your right into the dining room, to your left into the living room, and straight ahead into the courtyard. All of the main rooms on this floor open onto the courtyard. 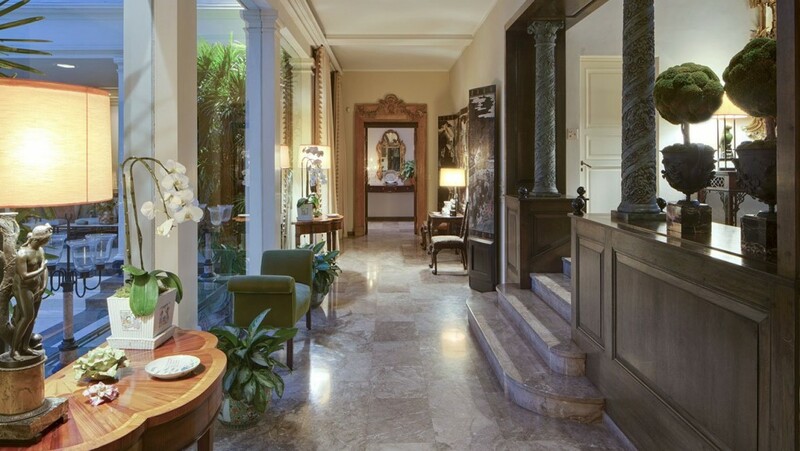 The lovely passageway which encircles the courtyard and accesses each of the main rooms. 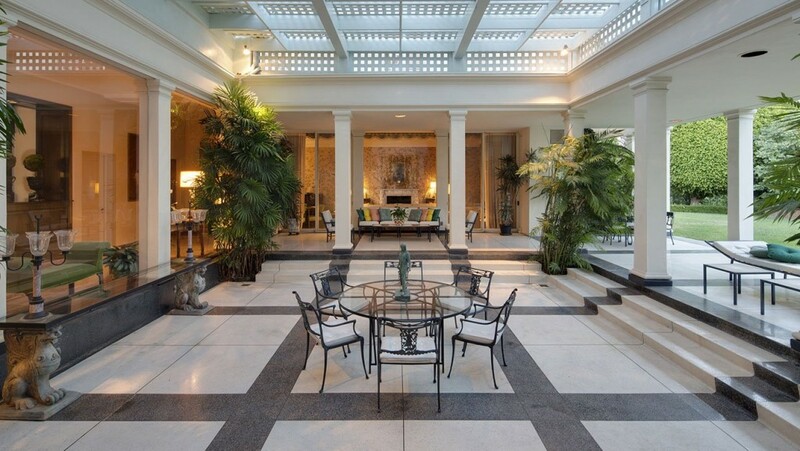 The stunning courtyard, as seen from the dining room, looking across into the living room. The lawn and pool are to your right; the entryway to your left. I actually love the chaise you can just see on the far right of this image. 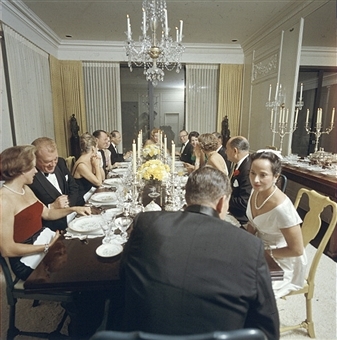 From the living room, (where the pictures from the party photo were taken). This image was taken from the fireplace, looking back across the courtyard into the dining room. 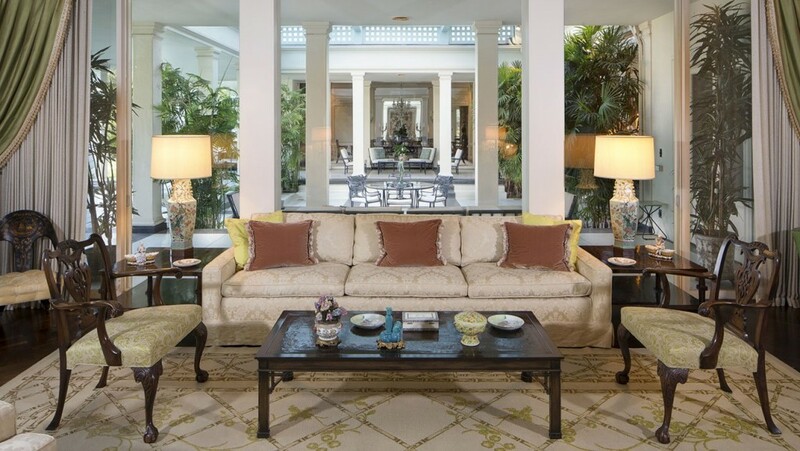 Notice the garden sofa and chairs backing up to this seating arrangement, but looking onto the courtyard. 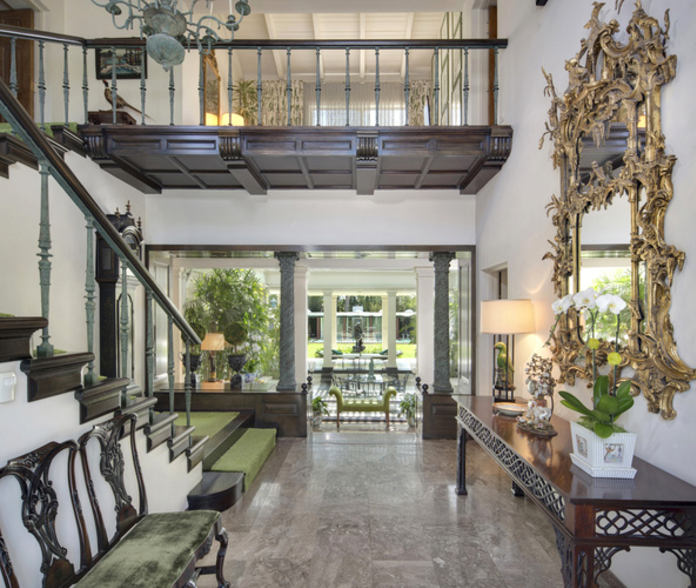 I just love how the decor of this house focuses on the stunning courtyard. Entering the living room from the ‘hall’. 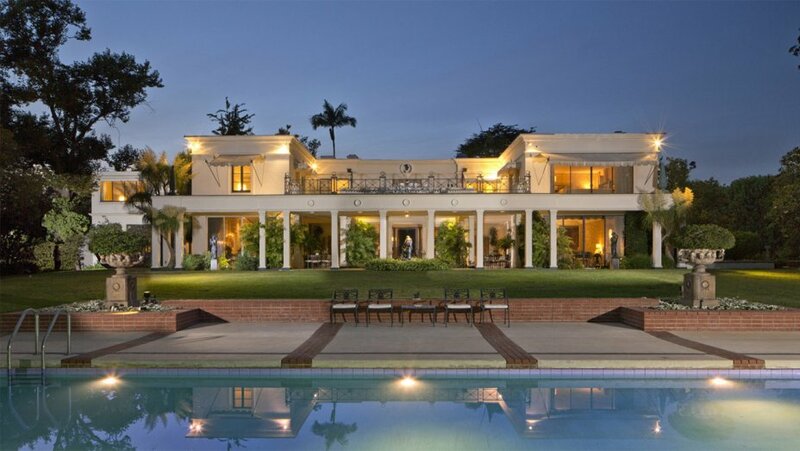 Note the plate-glass windows looking out over the lawn and pool. While I’m not a fan of the sofas’ upholstery, the overdone draperies, nor of the Chippendale armchairs and coffee tables, this room is a comfortable space. 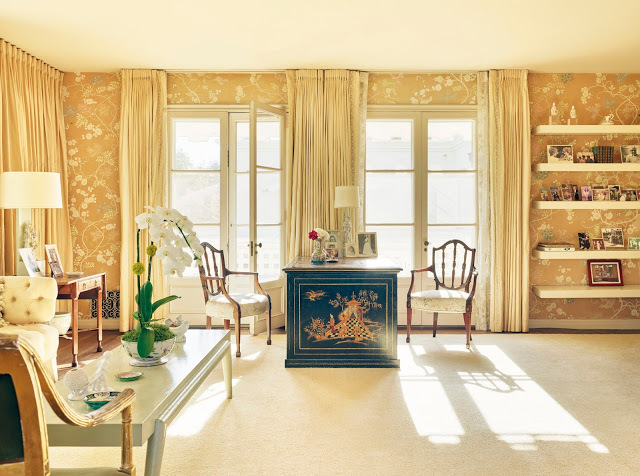 Just imagine this room with no draperies, sofas upholstered in a brilliant blue velvet the color of the birds from the wallpaper, a pair of modern, curvy, oversized white candlesticks on the mantel, Louis ghost chairs in place of the Chippendales, and polished, white quartz coffee tables. You’d be ready to host a party there tonight. The view of the living room from the lawn-facing windows. Detail of the living room’s wallpaper. 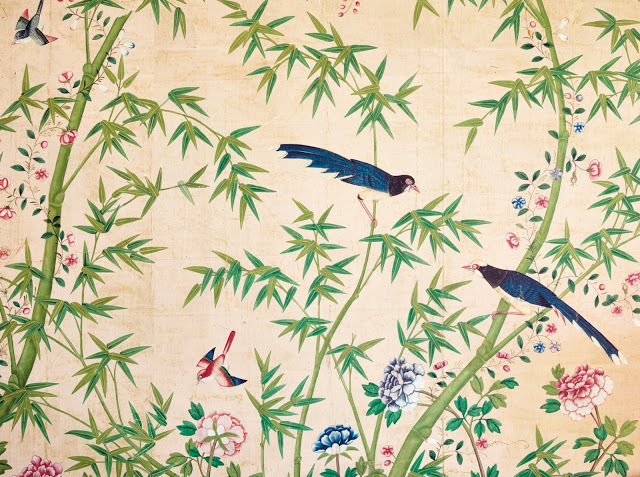 Chinoiserie wallpaper is coming back in a big way. On the far side of the courtyard is the dining room. This daytime shot doesn’t do the room justice. The dining room in the evening. I like this shot because you can see so clearly how the house flows from interior space to exterior space so seemlessly. Note the logia space to the left, and the pool and it’s spacious house directly out the rear windows. 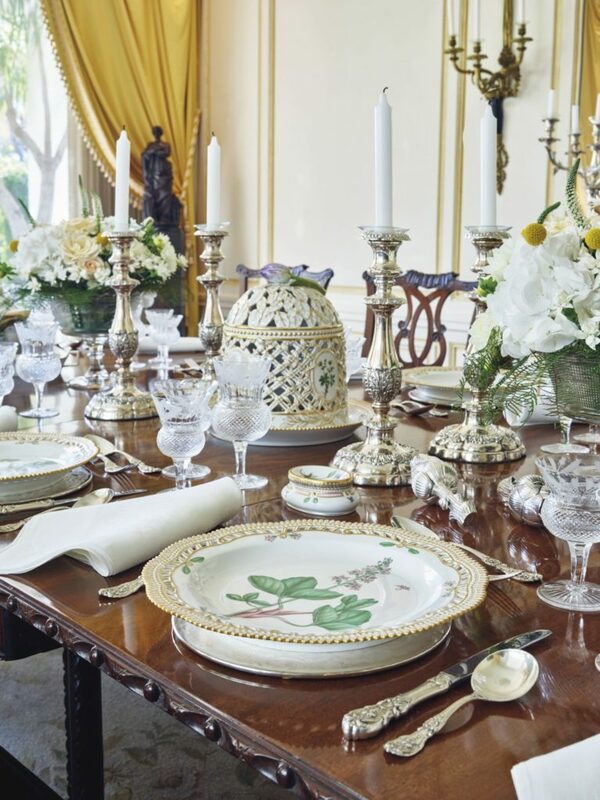 A gracious, spring table setting. A good party takes some planning. 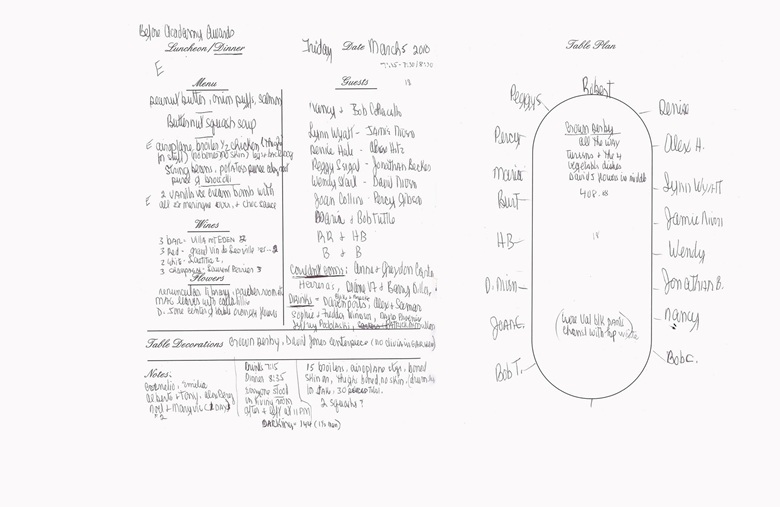 And Betsy was quite the planner. Her circle included the Reagans, the Jimmy Stewarts, and many others. She took a cue from the grand dames of the Parisian salons, and always tried to include an interesting artist or writer to make the evening sparkle. What fascinating conversations must have taken place at Betsy’s table. 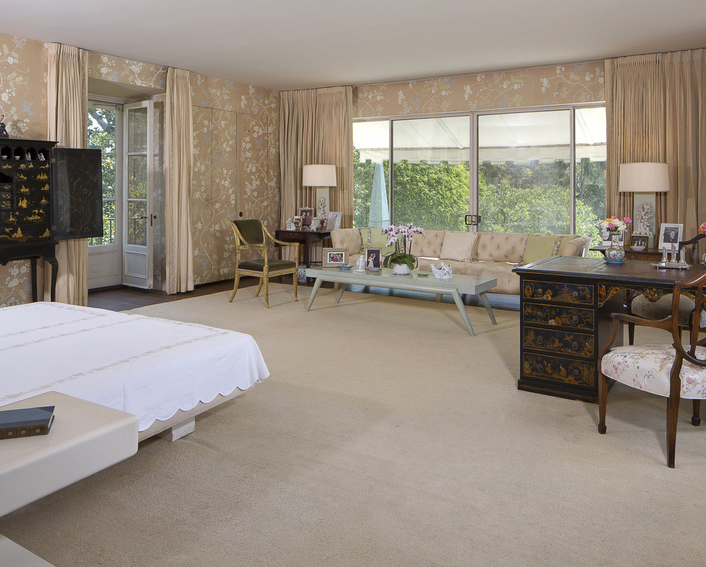 Moving upstairs, here’s a look at Betsy’s light-filled bedroom. I have railed against wallpaper, but the use here is quite soothing. And the french doors are just perfect. Betsy’s light-filled bedroom, from another angle. The sliding doors lead onto an awninged terrace that overlooks the pool and pool house. You can’t appreciate the light of the room, or the intimacy of it, from this picture, but it gives you a better sense of the layout. The house at night, as seen from the pool house. Betsy’s bedroom is on the right, upstairs. What a great view! 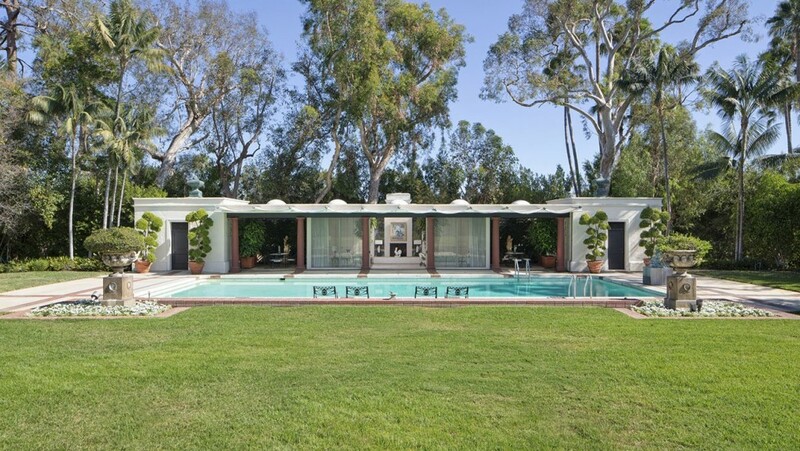 The sprawling lawn leads to the essential California swimming pool, with it’s gracious pool house. 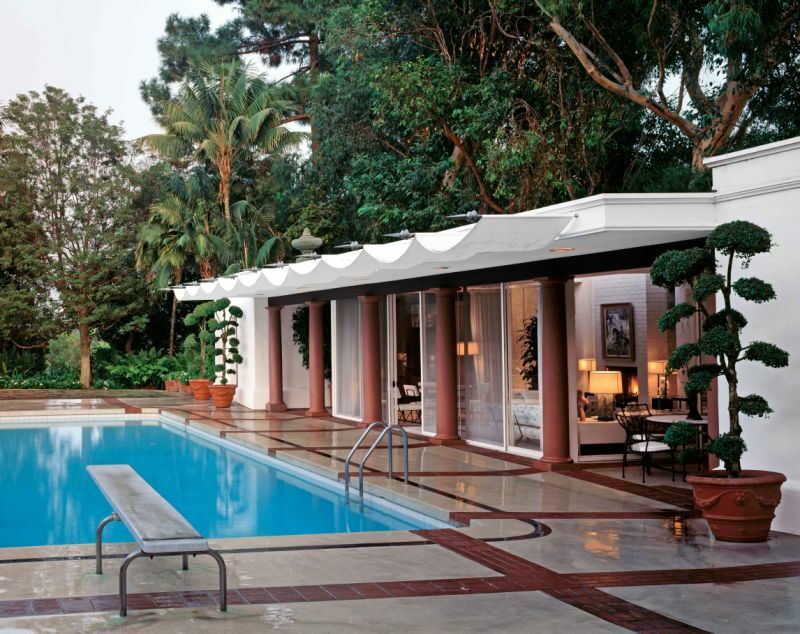 Just as the terraces off the upstairs bedrooms of the main house have cloth awnings, so the pool house does. I love that these drape, creating a scalloped effect to counter the vertical columns. The lady herself, reigning over her spectacular courtyard and home. I hope you enjoyed the tour. 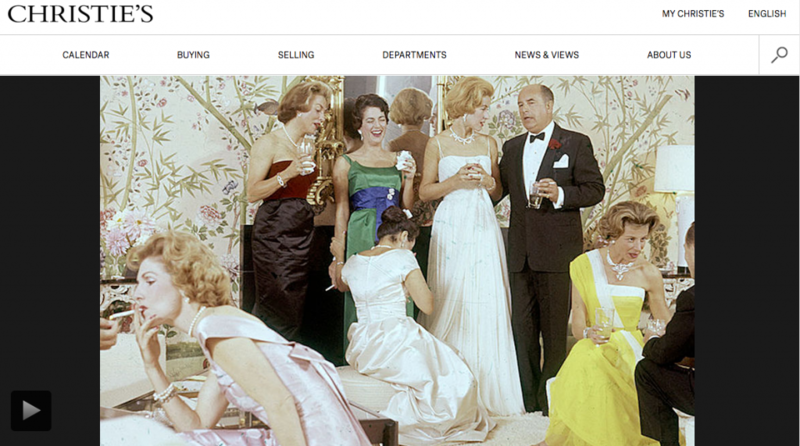 Take a look at the Christie’s site and see which items you can pick out from these pictures. Enjoy!